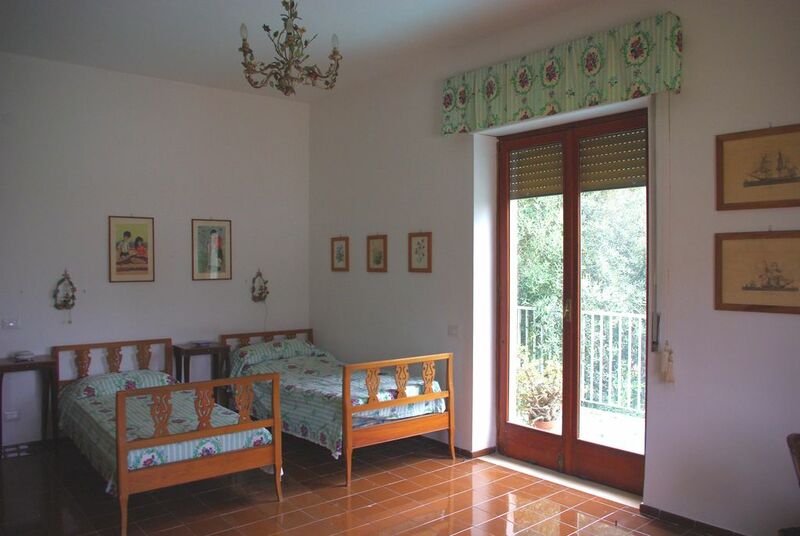 Situated in a quiet residential area, near the centre of Sorrento, “Casa del limone” is a lovely and newly refurbished flat on the top of a two floored building. On one side it offers a nice view on an historic citrus grove while the other is open on a quiet courtyard, plenty of bougainvillea, oleanders and other autochthon. Pavements are in Vietri’s majolica and interiors are cosy and classical. The all flat has been refurbished in 2010 and offers two double bedrooms, two bathrooms (one with bath/shower) fully fitted kitchens, living room and two large balconies, ideal for a lunch in the sun. The flat’s garage (measures: width 210cm, high 190cm, depth 500 cm) is in the basement and it’s perfect for those travelling with car (parking is not easy and not cheap in Sorrento!). The museum Correale di Terranova, ancient house of a noble family,full of important furniture and paintings is 10 minutes walking. Though the Circumvesuviana station, (to Pompei, Ercolano, Napoli, ecc.) is only 10 minutes walking and the harbour is about 20 minutes walking, with ferries to Napoli, Capri, Positano, ecc. Surroundings are full of good restaurants, Limoncello tasting, gastro-shops, beaches and lovely promenades. On request car tour with personal “chauffeur” can be arranged, as well as restaurant reservations or a dinner cooked at home, with traditional Neapolitan dishes. Set in a peaceful gated development, this 2nd floor apartment had good views of the surrounding lemon groves from the large balcony. The apartment is well-equipped (microwave, large cooker, fridge/freezer, dishwasher, washing TV, wifi etc). It is a few minutes walk from a restaurant popular with tourists (Tavola di Lucullo), while a few minutes further are local grocers and a supermarket. It is a short walk from the railway and bus interchange from where there are frequent services to Pompeii, Herculaneum, Naples and Naples Airport. Thank you Paola and Roberta for your hospitality. We really do our best to make our guests feel at home and enjoy their stay, so it's lovely to read such a review, thank you! The flat is comfortable and well equipped. We particularly liked the large balcony with table, chairs and two garden swings. Here we relaxed and ate meals. Inside the flat there are good views from all the windows. Sorrento town centre is an easy 20 minute walk away. Thanks for your review, we hope to have you again in our flat in Sorrento. A fantastic holiday in Sorrento! An extremely charming and cozy apartment, with a wonderful view over sea and mountains! Det har varit en underbar upplevelse att få bo i lägenheten. Den är mycket trevlig och lagom stor, med en vacker utsikt och en stor terass där man kan sitta och titta ut över havet och bergen. Ganska centralt, med en mycket fridfull miljö. Och dessutom så nära till havet, stränderna och hamnen! Huset är rent och jag blev bemött med stor vänlighet av ägarna, med en charmerande "italian style". De är mycket trevliga människor! Just 10 minute walking from the centre of Sorrento and the Circumvesuviana train station (to Pompei, Napoli, Ercolano, ecc.). About 500 metres from fitted beach. 15 minute walking to Museo Correale di Terranova. Lots of restaurants, pizzerias, bars, shops and excellent bakeries around. As well as trekking opportunities. Cleaning is not included. Final cleaning is compulsory and costs 50 Euro.